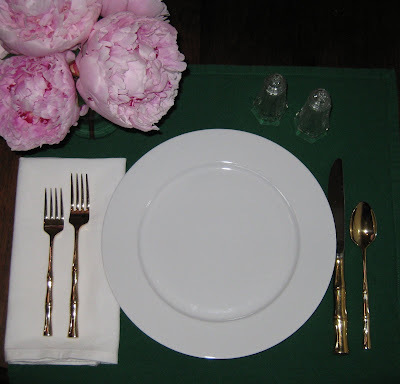 In my post about my new flatware find I totally forgot to mention the best part...the whole sent, service for 12, butter knife and serving spoon and all was a whopping....get ready....$18!!!!!!! $18?? What a deal!! I want to shop with you! Oh, my! Wish I could find something like that! Ok, now we just hate you a little for this...ha! Where are these kinds of amazing finds at my flea markets! Care to share your favorite haunts? I'd love to spend a rainy day looking for treasure...and according to today's weather report we're going to have plenty of rainy days in the near future. 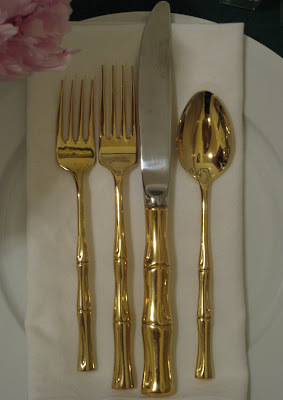 i have been searching high and low for some gold, bamboo flatware. you found it!!! and for a steal at that. great find! wow! what a deal! and they are fabulous.